The social media giant is working to bring more relevancy to auto ads and open dialogue to dealership service shops by tailoring its dynamic ads and lead ads offerings. The dynamic ads feature allows dealerships, manufacturers and third-party sites to upload vehicle inventory along with information such as make, model and year. Facebook says it then automatically generates ads for interested shoppers that can drive them to vehicle detail pages, lead submission forms or any other place the advertiser wants them to go. The company says auto marketers can deploy ads across devices -- smartphones, tablets and computers -- that are unique to each uploaded vehicle without configuring the ads individually. Facebook has made the dynamic ads function easier for the auto industry to use. The feature has been around for nearly three years but was geared toward e-commerce advertisers. There were workarounds for auto marketers to use the feature, but it wasn't available to everyone like it is now, said Stephanie Latham, Facebook's director of U.S. automotive. Latham says dynamic ads matches vehicles to people whose activity on and off Facebook suggests they're in market for a car. Facebook can further target the ads to people with interests that are similar to those of the known in-market shoppers. "We've listened to everything we've heard in the industry on what we need to do to make these more compelling and impactful for auto. Buying a car is such a low-frequency, high-consideration purchase, we want to make sure we're giving dealers and manufacturers the tools and opportunities to catch the right person with the right vehicle at the right time," Latham told Automotive News. She added, "If you're going to a dealer-specific website and looking at a specific vehicle, we're able to target you on Facebook and target people who look like you on Facebook with that vehicle and other vehicles that have similar characteristics. It's more than retargeting; it's also prospecting. We're able to find people who've not just raised their hand for that specific vehicle, but people who look like them, and convert them, also." 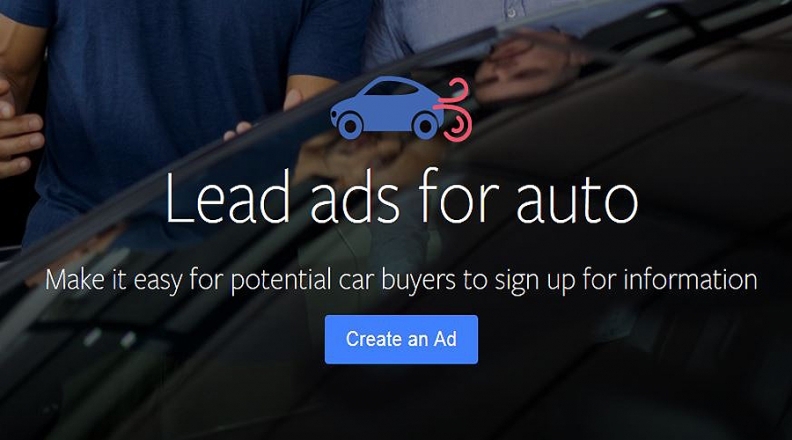 The lead ads tool, which automatically fills in forms with users' details such as names and email addresses when they engage with certain News Feed ads, is being strengthened for the auto industry. Latham said Facebook now is connecting the feature to dealership service operations so consumers can share their preferred appointment time frames. Stores can use it to learn a person's ideal times for a test drive as well. 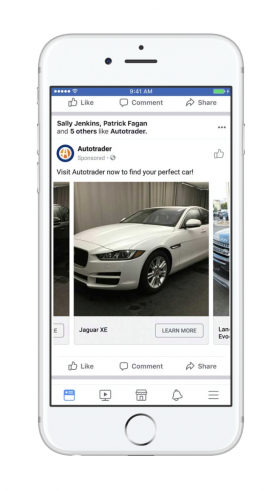 Facebook also is introducing a locator feature to lead ads that helps consumers find dealerships that are closest to them. The feature could be leveraged by manufacturers and regional dealer associations to funnel online shoppers to dealerships. In addition, the company is making lead ads more immersive by meshing the feature with its full-screen Canvas experience. Built for visual appeal, Facebook says the Canvas layout allows marketers to provide more details upfront before a consumer decides to share their information. Lead ads has been used in the past by BMW UK to speed the lead submission process for test drives. Land Rover, on the other hand, has turned to lead ads to make it easier for consumers to request quotes.